Human negotiators at Bolingbrook’s Clow UFO Base spent an hour of hell persuading the Martian Colonists to allow NASA’s Curiosity rover to land safely. The problem with Curiosity, according to another source who asked to be called Neil, is that it was somehow interfering with the Colonists’ equivalent to a cellular network. Though the colonists live underground, they do have a surface wireless network that provides global coverage. Human negotiators at first tried to appeal to the Colonists love of science, and promised to share all of Curiosity’s data with them. When the Colonists didn’t budge, they promised to release more air brushed photos of the Face on Mars to erase any suspicion that it is a memorial to the last indigenous human from Mars. As the landing window drew nearer, the human negotiators considered letting the Colonists choose the next President of the United States. When the Colonists countered with being allowed to choose the next Mayor of Bolingbrook, the humans immediately rejected the offer. With the minutes slipping away, Nicole Gugliucci, radio astronomer, Skepchick, and last minute substitute for the Skeptical Movement’s negotiator, Dr. Pamela Gay, solved the interference problem. Gugliucci explained that while this reporter would have to earn a PhD before beginning to understand her solution, it was, to her, easy to solve. Though she is credited with saving NASA billions of dollars, Gugliucci seemed quite humble. 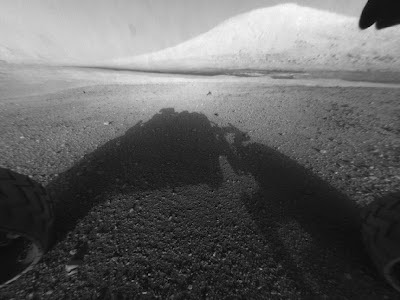 Curiosity will spend the next two years searching for evidence of indigenous organic compounds. NASA has promised to “touch up” any evidence of the Colonists’ presence on Mars.